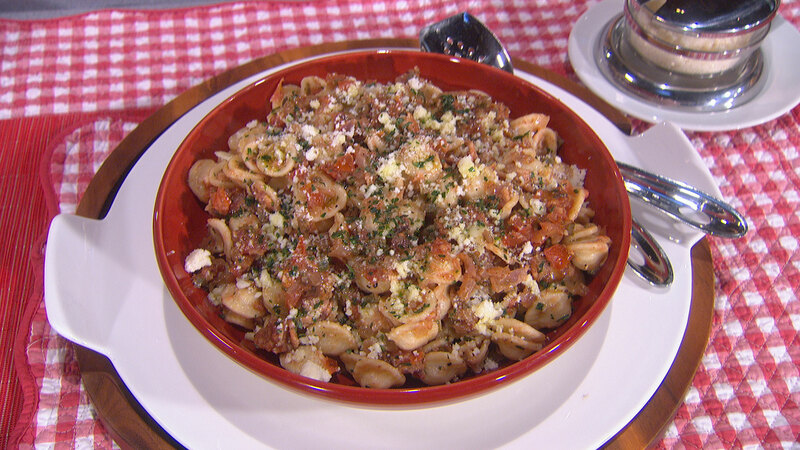 Chef Fabio Viviani, author of "Fabio's American Home Kitchen," shows us a quick & easy dinner you could whip up on any busy weeknight. 1. Cut the tomatoes in half, seed them and chop them roughly. 2. Melt the butter in a pan over medium heat. Add the bacon and cook until it is crispy, about 5 minutes. Add the jalapenos, onion, and garlic, and cook over medium heat for 10 minutes, or until nicely caramelized. 3. Add the tomatoes and thyme to the pan, then season to taste with salt and pepper and add the tarragon. Turn the heat down very low to keep the sauce warm while you make the pasta. 4. Bring a large pot of salted water to a boil, add the orecchiette, and cook just until al dente, 6-8 minutes. Drain the pasta, return it to the pot, and add the sauce. Stir to combine, then drizzle with the olive oil, and cook over medium-high heat for 2 minutes more. Mix in the Grana Padano and serve. See Also: Evette Rios' Recipes for Creamy Avocado Pesto Pasta & More! 1. Preheat the oven to 375 F. Line a rimmed cookie sheet or half sheet pan with a piece of parchment paper. 2. Lay the dough onto the paper and poke it with the tines of a fork across the whole surface. 3. Bake the dough for 10 minutes and remove it from the oven. 4. 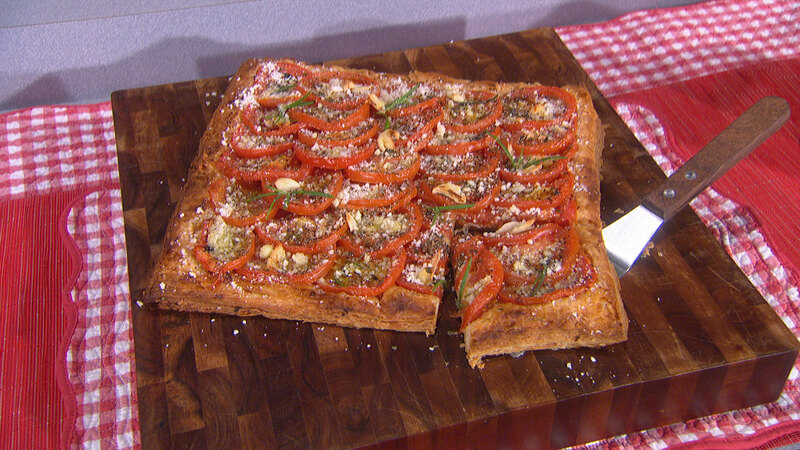 Lay the tomato slices over the dough so they overlap slightly. Distribute the thyme, rosemary, salt, and pepper evenly over the tomatoes, scatter the pieces of garlic on top, and drizzle with olive oil. 5. Bake the tart for another 25-30 minutes, or until the pastry starts to turn dark golden on the outside. Remove the tart from the oven, scatter the basil leaves and Grana Padano on top, and serve. See Also: Kris Jenner's Recipes for Spicy Tomato Salsa & More! 1. To make simple syrup, combine equal parts water and sugar, bring to a boil, then let it cool down. 2. Stir the syrup into the coffee then set it aside to cool. Pour the cooled coffee into a pan or a wide shallow container that will fit on a shelf in the freezer. Slide the pan into the freezer. 3. The liquid will become slushy around the edges within 2 hours or so. 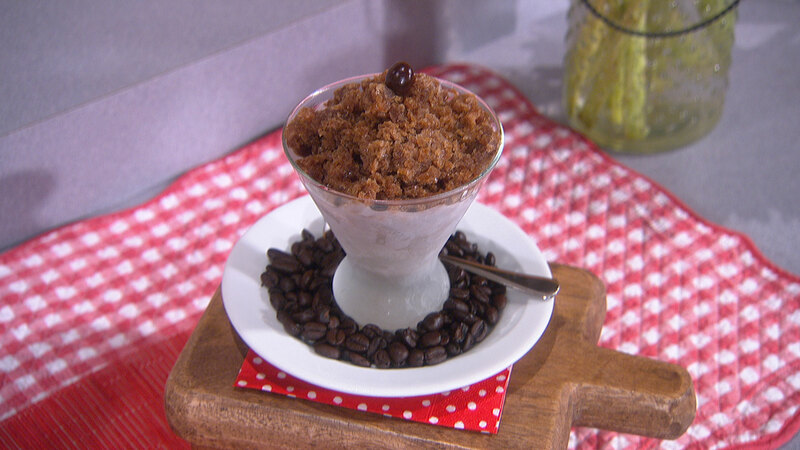 Scrape the granita with a fork where it is beginning to freeze. Continue stirring, scraping and breaking up and lumps every 20 to 25 minutes, until the granita has frozen icy crystals throughout. The whole process will take 3-4 hours, depending on how many times you open the freezer to peek – naughty! Serve in chilled glasses with gelato on top if you want. Paul Bartolotta's Recipes for Roast Loin of Pork & More!